Sue Nakanishi looked yesterday onto the intersection of Kanunu and Kaheka streets from her store, where her 16-year-old Pomeranian, Missy, used to go for walks and greet customers. MISSY, the canine fixture of Kaheka Street, is missing. 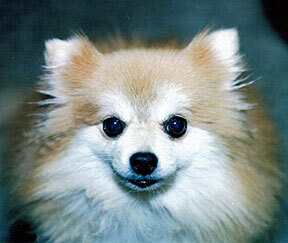 Some people reported seeing a man carrying the Pomeranian, and one person said a man was trying to sell Missy. The dog could often be seen taking daily naps on the sidewalk outside her owner's store, Sue's Mini Mart. Owner Sue Nakanishi said she last saw Missy on Dec. 21 when she let the dog out to "sniff around." She never came back. "She always barks for me to let her in if the door is closed, and she never did," Nakanishi said. "The store is so empty without her. "I brought her to work every day since she was a puppy for almost 16 years now. She was my baby." News of Missy's disappearance spread quickly and was even announced during services at nearby Saints Peter & Paul Church. It was there Allene Ishikawa heard the news and called Nakanishi to tell her that she saw Missy being picked up by a man the same day she disappeared. "He squatted and picked her up, and she tried to get away." Nakanishi said security guards at the Kapiolani Bel-Aire on Kaheka Street confirmed that they saw a man holding Missy and crossing over toward Daiei. 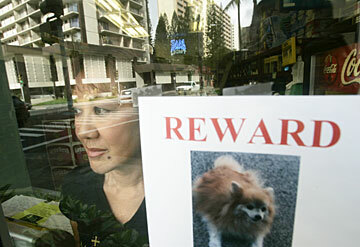 And after Nakanishi made out fliers about her lost dog, she said she received a call from a worker at Tapioca Express on Kapiolani Boulevard, saying someone tried to sell a dog that looked like Missy. "It was about two weeks ago," said Mealii Bermudez. "The guy was sitting on the ground with the dog, and she looked like she was hungry and I said she was cute. "He said he's trying to get rid of her because he can't take care of her anymore and that she was worth $1,500 but that he was selling her for $80. "He said her name was Precious, but when I called her that name, she didn't even turn her head. ... She didn't look right. She was shaking. ... It was kind of suspicious." Since then, Nakanishi has had several other leads and sightings of Missy that she has followed up on but have not panned out. She is hoping that whoever has her dog will give her back, no questions asked, because Missy has been without her heart medication since she has been gone. "She also has thyroid medication and she has cancer," said Nakanishi. "They couldn't operate on her because of her age, and they gave her six to eight months to live if she didn't take any medication. "Every day that she's gone, they're shortening her life span." Nakanishi said that besides filing a report with police, she has also hired a private investigator and a psychic, and is offering a reward but does not want to say how much she is offering. Anyone with information about Missy's whereabouts is asked to call Nakanishi at 387-7837.